Singapore folks had a debate a while back. The topic was about which food should be the national food. Tussle between to dishes to be crown as Singapore National Food was Chicken Rice and Chili Crab. At the end of the day, Chili Crab took the converted title. After Chili Crab was crowned, then another debate soon followed. Which stalls actually serve the best Chili Crab. In my personal opinion, is hard to tell which stall or restaurant serves the best Chili Crab. Firstly, you have to eat in all of the restaurants before you can judge. Then the factors of your own personal taste such as some like it really spicy and some don’t. Well, I think the reason people debate on this matter is because there’s nothing much to argue about when you having beer with your friends. So I would say is just an argument for the sake of argument. I have no idea why it is named Chili Crab in the first place when tomato puree is a big part of the ingredient. I am not going to start another debate on why it is named Chili Crab instead of “Tomato Crab With Some Chili In It”. The stall that I frequent often for my Chili Crab is No Sign Board restaurant in Geylang. Is not that they have the best Chili Crab in the world but I love their White Pepper Crab dish instead. So I just order the Chili Crab there out of convenience, but the taste is quite good too. 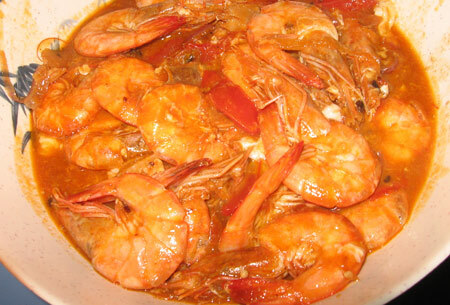 So now I am in the Philippines with no Sri Lankan crab, I have to resort to making Chili Prawns instead. I’ve bought some crab from the alimango seller on the road side. Looks like Sri Lankan crab but not much meat under the shell. So the best option is to use prawns. 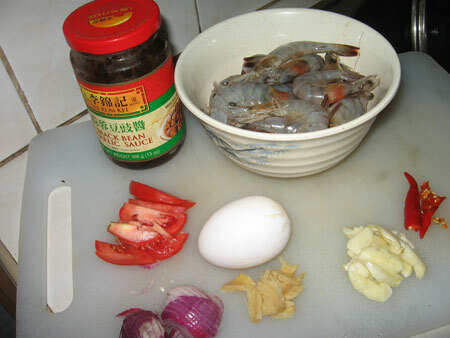 Enough ramblings and on to my version of Chili Prawns. My Caucasian friend will definitely not enjoy this dish as the head of the prawn is still intact to the body. They think sucking on the head is gross but actually this is the best part of eating prawns to Asian. My advice to my Caucasian friends is, whenever you come to Asia to taste the food please leave out the eye sight sense. Just use the other senses like taste bud and smell. This dish can actually serve with pandesal, french toast or better yet those fried buns you see in the Chinese restaurants in the Philippines. Normally people call it “Mantou” but I not sure what they call it here. But suggesting to Filipino to eat a dish with a lot of sabaw (sauce) with bread is kinda crazy idea. They will surely tell me is sayang (wasted) if you do not eat dishes with a lot of sauce with rice. Sige…sige…kanin na nga. Ikaw bahala.